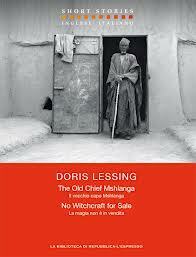 Old Chief Mshlanga research papers delve into a story by Doris Lessing about african natives and how the white people made fun of the natives. As a young girl growing up in Africa, the narrator came into contact with many native Africans. Those who found themselves in the employ of her family were the fortunate ones, she believed. While she acknowledged that they exist, the narrator took for granted the servant-like way in which, as she described, “the servants in the house would come running a hundred yard to pick up a book if she dropped it.” The narrator, accustomed to constant service, had never wandered too far from the confines of her father’s land. When she traveled on the land she took along dogs, ready at a command to attack any African natives which approached her. For “safety’s sake” she carried with her a gun--completely useless, in most cases, and never really a necessary option for self-protection. The narrator remarked that white children often spent time together making funning of blacks--the native Africans, and the way in which they were served by them. She commented “they could set the dogs on him and watch him run--they could tease a black child as if he was a puppy.” In keeping with the modernists point-of-view, the narrator describes actions that to her, as an adult, are appalling, and those which, to her readers, are equally disturbing. The narrator’s life and perspective are changed completely when one afternoon she comes across a group of African natives approaching her father’s land. As she is out walking alone, she has her dogs as well as her gun with her. Interestingly, the group approaching her is part of a tribal council, as the leader of the tribe, Chief Mshlanga is with them. She is surprised that he recognizes her and that he remembers her by describing how big she was the last time he saw her. Upon realizing that she is addressing a tribal chief she is embarrassed that she has taken part in the typical disrespect that whites gave the natives. Paper Masters writes custom research papers on Old Chief Mshlanga and delve into a story by Doris Lessing about african natives and how the white people made fun of the natives.